I love the look of burlap, but I don't love touching it. So today I am sharing a quick DIY Burlap Decor Craft and Tips for crafting with burlap that will help you craft more and itch less. Whether you want to make a gift or a little decor accent for your own, this burlap sign is a quick and easy decor craft you can make with only requires a few supplies. 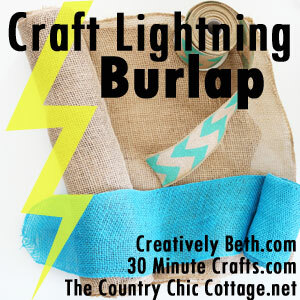 Let's explore some crafting with burlap today! You can create this pretty burlap sign in minutes with your Cricut machine. Customize the design however you'd like. My favorite part for this project, letting the Cricut cut the burlap instead of me and my itchy scissors. I like using cut vinyl to decorate the vinyl instead of painting the burlap.. it's a quicker method to create a pretty design. Goto the Cricut Design Space canvas I've already set up for you. Follow the on-screen instructions to cut your layers of vinyl and burlap. Heat set the vinyl to the burlap. This can be tricky, so you might want to try a test first. I found that If I did 3 rounds of 30 seconds at about 325 degrees and then let the vinyl backing cool before peeling, I had the most success. The vinyl is not going to give you a clean set with the burlap. The loop will be a little rough and wrinkled, but I think that just adds to the rustic look of the piece. Glue the burlap to your base, if you have one. You can actually use burlap as the base. It's sturdy enough to stand alone for banners, signs and other country-chic decor. Just make sure to finish the edges (apply a little glue around the edge) to prevent unraveling. Add any extra accents or embellishments to your sign. I've joined with the Craft Lightning girls again this month to share this fun project. There are a ton more Burlap project ideas for you to try. Check out all the ideas by visiting below. Why Use Burlap to Make Crafts? Burlap is great for accenting a country style. You can easily make rustic wedding decorations for very little cost. Burlap is pretty easy to find. Just check your local fabric or craft store. I found 12×12″ sheets in the scrapbook section of my local Hobby Lobby store. Burlap is very sturdy. It is a great all weather fabric that can hold its shape and endure weather changes. Just make sure to seal cut edges to prevent fraying of the fabric. I think there are some lucky crafters that aren't bothered by handling burlap, aka jute, fabric and materials. I, on the other hand, itch like crazy. Sometimes it makes me break out in itchy welts. But darnit, I love the look of the rustic texture and the natural colors. So the idea is to touch the burlap less and craft pretty things more. Here are a few tips to help you craft happy with burlap. Cut the burlap with a tool that doesn't require you to handle the fabric for long. A rotatry cutter, die cutting or an electronic cutter (like the Cricut) are great alternatives to traditional scissor cutting. Seal the fabric before cutting small pieces. A simple coat of mod podge can save you from shredded cut designs. Also seal the edges of the fabric to prevent fraying. If you are applying the burlap to another surface, just make sure to glue down along the edges and you should be good. Keep in mind, because burlap is an allergen for some people, using too much at an event can make for an uncomfortable situation for your guests. Instead, use the burlap for pieces that no one has to touch. Use the burlap in smaller quantities so the fibers don't fill the air… too much burlap and my eyes get itchy and watery too. Burlap is an affordable fabric perfect for all kinds of decor and crafts. It's a great material to use for country wedding decorations, DIY gift ideas and even outdoor decor. I hope you've enjoyed this burlap project idea. Do you like working with burlap? I'd love to hear about projects you've made! I love adding iron-on to burlap! Thanks for joining!